Sermon preached on Romans 5:1-11 by Rev. 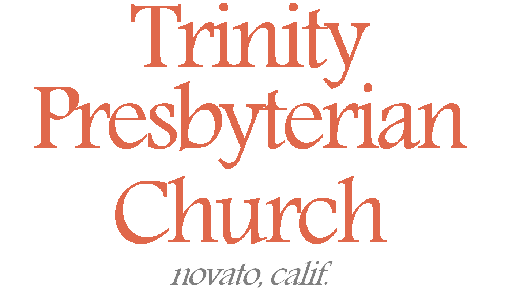 W. Reid Hankins during the Morning Service at Trinity Presbyterian Church (OPC) on 8/19/2012 in Novato, CA. Tribulation. That’s a scary word, but it is something we are all too familiar with. And it’s the subject we will be considering today. We read verses 1 through 11 and looked and them last week. But, today we are going to hone in on specifically verses 3-5 which deal with this subject. Verses 3-5, “And not only that, but we also glory in tribulations, knowing that tribulation produces perseverance; and perseverance, character; and character, hope. Now hope does not disappoint, because the love of God has been poured out in our hearts by the Holy Spirit who was given to us.” Amen. And so we’re talking about tribulation. And we are talking about the good that can come out of it. So that we can glory in such tribulations. So, let’s begin then by defining this word tribulation. This word for tribulation in the Greek can be used in a very general way. It’s literally a word of pressure. Something pressing down upon you. And so it’s a general word for various troubles and afflictions. It can involve the various pains and sorrows of this life. It especially has in mind the type of afflictions and oppressions that you might face from others. Christian persecution would certainly fall under this category of tribulation. Well, we need to study about tribulation. We need to study about it, because it’s going to come into our life. Jesus said that in this world we will have tribulation, John 16:33. Paul said in 2 Timothy 3:12 that all who desire to live a godly life in Christ Jesus will suffer persecution. This is the reality of life under the sun. In general, humans will all have tribulation. And Christians particularly will have tribulation; tribulation that includes Christian persecution. And so, we will have troubles, and sufferings, and afflictions. How will you think about it and respond to it, when it comes. That’s what this passage addresses. Well, this passage wants us to see a positive outcome for our tribulations. Yes, they are difficult. Troubles are going to be troubling. And yet, verses 3-4 present a sort of chain reaction that takes place for Christians when tribulation comes. This is like a cause and effect. One thing leads to another. Tribulation produces something. It produces perseverance. And then perseverance produces something. It produces character. And then character produces something. It produces hope. The idea of “producing” here is about bringing something about. The one thing is the stimulus in our life for bringing about something else. Again, a sort of chain reaction. Of course, as I present this chain reaction, maybe some of you can relate by way of the opposite. You see, verses 3 and 4 present a positive chain reaction. It’s a positive upward spiral. The tribulation leads you upward into something positive. However, maybe you’ve experienced the opposite. Maybe tribulation has led you to anger or denial, and maybe that has led you to depression. Maybe your tribulations have put you into a downward spiral, leaving you in a very negative place. Maybe even to question your faith. Well, if that is your story, this passage is here to encourage you and to transform how you think and respond to tribulation. God would not have it shipwreck you and your faith. God would have it to bring about growth in your life. So let’s step through this chain reaction and consider each part. The first one is that tribulation produces perseverance. Perseverance is that characteristic of endurance and patience and steadfastness in the mist of your tribulation. James 1:3 agrees with Paul here too. He says that the testing of our faith produces perseverance. James then goes on to point to the example of Job. Job had perseverance. Job was steadfast amidst tribulation. You see, this is where we see the connection with tribulation come. When the tribulation comes, one of two things can happen. You could not stand up under the tribulation. Or you can not stand up under the tribulation. In other words, when the troubles come you either persevere, or you fail. You either overcome with Christ, or you drown to despair. That’s why people who commit suicide during their tribulation are often described as giving up. That was the bad counsel given to Job by his wife. She told him to curse God and die. But Job wouldn’t do that. His tribulation in him produced perseverance. And so he pressed on. And of course like Job, this especially has in mind our faith. Will our faith persevere? Will our faith endure through it all? For Job it did, and so he is an excellent example of this. OPC Minister and Professor John Murray said of this perseverance that this is something very active. Sometimes we can think of patience in the midst of trouble as something passive. Sometimes we can think of enduring as something passive. You are just going to grin and bear it until it’s over. Though there may be some truth to this, Murray made the case that this is to be seen as something active that you do. You actively, consciously, set out to persevere amidst the trial. In Romans 12:12, Paul actively calls us to be patience in tribulation. This is something we do. It’s how we respond to tribulation, and thus a product of it for us as a Christian. And so I think the idea here is that our tribulations can help develop this quality in us. We grow in this trait of endurance through our tribulations. Maybe when you are young as a Christian, you find yourself struggling and stumbling more through the tribulation. But as you grow through more and more tribulations, you hopefully find yourself able to endure them more easily. Physical training is a good analogy here. When you are training physically, your physical endurance is something you have to develop. When you’ve not been training, you have some endurance. But as you train, your endurance improves. So to for us with tribulations. For the Christian, we ought to find our endurance grown through the affliction. It would be help as a theological point here to point to divine grace. When we find ourselves enduring amidst a tribulation, we should humbly give credit to God. Verse 2 here talks in general that a Christian stands by grace. Surely the same is true with regard to our tribulations. Surely we endure and bear up under tribulation by divine grace as well. This theological point then is to glorify God in how we endure. This doesn’t take away a call to endure, of course. But notice that this passage isn’t even putting this as a command. It’s not a command here that when tribulation comes, you must endure. That’s true. I mentioned that it’s commanded elsewhere. Certainly the command is implied here. But here the focus is on something bigger. The true Christian can be encouraged that he will persevere. That God will uphold him. And so don’t miss the implied call here to endure. But be encouraged that as you look to live that out, that we know God is the one who will bring it out. That comforts me. I hope it comforts you as well. For the Christian, tribulation will in fact produce perseverance. Be encouraged by this revelation. Use it to encourage your faith when you find yourself under the affliction. Well then, this leads naturally to our next step in the chain. Perseverance produces character. Here’s one of those places where I just don’t love the English translation. The NASB is better when it says it produces proven character. It may not sound like great English, but a better translation would be simply “proven-ness” or “approved-ness.” Perseverance produces proven-ness. This word is about being proved to be genuine. It’s the trait of someone or something that has been examined and tested and found to be true. It’s like if you took what you thought was a diamond to a jeweler and they looked at it closely and confirmed it to be a diamond. This same word is used in Philippians 2:22 to refer to Timothy’s proven character, of how he showed himself to be such a genuine servant of Christ as he labored alongside Paul. It’s also used in 2 Corinthians 2:9 where Paul talks about how he’s been writing to exhort the Corinthians in order to find out if they have this proven character. He says they’d show that by obeying his instructions. And so those other references confirm how we should understand this word here. This verse is saying that perseverance produces inside you the trait of being proven. Of course, what’s particularly being shown as proven inside you is your faith. Do you have true faith or not? Scripture talks in several places about false faith. There are different kinds of false faith out there. James, for example, says that faith without works is dead. That’s an example of a fake faith. Faith that says it believes, but has no works along with it proves that it is not genuine faith. So too with the relationship of your faith with tribulation. Your tribulations will ultimately show your faith to be genuine, or they will show it to be false faith. That is of course Jesus’ explicit teaching in the parable of the sower. In Mark 4, Jesus says that this is like the seed sown on the rocky ground that at first sprang up so quickly, but as soon as the sun was up got scorched to death, because it did not have any roots. When Jesus interprets the parable for them, he says that this is like the people who make an initial profession of faith, but when tribulation or persecution comes for the word’s sake, that they fall away. He says there that they only endure for a time. In other words, Jesus shows that tribulation can show that some people don’t have real faith. That when put to the test of the tribulation, they show themselves to not be proven true. In other words, we see here that tribulation is inherently a test. This was seen in the early church during the Roman persecution of Christians. Sadly, many did renounce their faith when given the choice between that or persecution. Now many of those people later repented of that and did return to the faith. Maybe some of those people really did have a genuine faith, but faltered when put to the test. But when they renounced their faith, it at least outwardly looked like they had a false faith. Had they not renounced it would have been evidencing a lively faith. Ultimately, that’s what is the difference between the true Christian and the false Christian. The true Christian will ultimately persevere. The tribulation will come, he will persevere, and he will show himself approved. The false Christian, will ultimately not keep the faith. He will not show himself approved. And yet realize that this is something as well that is developed. That again brings us to that same theological point of encouragement. God is the one at work in our lives by grace to grow our faith. He is the one at work to bring forth this proven character of our faith, even amidst tribulation. And so your “proven-ness” is something produced even through this chain of perseverance. Like how we can grow in endurance, we can grow in this approvedness. So, thus Paul can command Timothy in 2 Timothy 2:15, to be “diligent to present yourself approved to God.” This is something we can diligently work at. And in the tribulations we can actively pursue to show our faith proven. And so again, be encouraged by grace that God is at work. The true Christian will indeed show himself approved amidst trial. And yet don’t let that take away from the implied call here to seek this out too. But as you seek it, know that this is what God does through the Christian’s tribulation. He develops the proven character of your Christian confession. Let’s turn now to the final step in the chain reaction. This proven character produces hope. Of course that’s what we’ve been talking about. Our sermon two weeks ago in Romans was especially all about hope. A hope contrary to hope. A hope that the world does not believe in. But a hope that we have found to be certain and true. And so here in the midst of troubles and afflictions, Christians find that it results in hope. A persevering faith proved genuine through tribulation, gives us confidence that we have hope. It instills in us a growing hope, hope even amidst the troubles. Of course, that is what we so deparately need when we are going through hard times. What we want and need is hope. When we were training for biblical counseling in seminary, they said that one of the main goals in your first session is to establish hope for the person. I can understand that. And here God encourages us that for the Christian, tribulation will have the ultimate outcome of bringing out hope in our lives. Well, what is that hope? Well, I’d mention that it’s a twofold hope. Surely, there is hope for the immediate circumstances of life. Hope that in the midst of the tribulation, that God is there. He is with you, and he still has a good plan for your life. That God can give you a peace that transcends all understanding as your endure that trouble. That you can take heart in Jesus who himself has overcome the world. So many passages that talk about how we can have hope even here and now amidst the tribulation. And yet, we know that ultimately our hope lies even beyond this life. Abraham’s hope was in God’s promises, promise that he would have a son. And that through that son he’d have another descendant who would bring blessings to the world. Blessings that Abraham knew had eternal and heavenly dimensions. And Abraham’s hope and faith meant his justification before God. And all that then is our hope as well. Christ has come. We have believed in him. That his death on the cross was so that we would be forgiven of our sins. We trust and hope in his promise, that though we die, we shall live again. That he is coming again to bring all his people of faith into an eternal state of blessing. A place where there will no longer be tribulation. A place where there will no longer be tribulation. That’s the hope I need when I go through tribulations. That it will pass. We may or may not find relief in this life, but it will only be for a time. That is our ultimate hope. And for the Christian, our tribulations will in the end grow us in that hope. Paul then drives home this point about hope by pointing not just to the future, but to the past and present. This is where we should find encouragement for our life even now, because even now this hope has something very tangible for us. Verse 5 says that this hope does not disappoint. Why? Because God has poured his love into our hearts. And how has he done this? Through his Holy Spirit. He’s told us that he loves us, and we know that because his love lives inside us. Because his Spirit lives inside us. So, in the midst of the harrowing troubles of life, our hope is encouraged by the love of God. True love that we know deep inside us. And that love is not just internal and present. It’s also externally seen in the past with Christ and the cross. Verse 8 says that this is how God has demonstrated his love to us, while we still sinners, Christ died for us. This then is how we know that our hope is sure. How we know it won’t disappoint. God’s love tells us that we know that this hope is sure. God’s love has confirmed this hope. It’s proven that the hope is genuine. Objectively we’ve seen God’s love, because Christ came and died for us. Subjectively, we’ve experienced God’s love because his Spirit has moved into our hearts. Both of these expressions of his love should encourage us. And then we are encouraged as we read on in Romans 8 that nothing can separate us from that love. Paul includes there in that list tribulation. Not even tribulation can separate us from the love of God in Christ Jesus, 8:35. And so again, we should be encouraged as Christians. When we experience tribulations, Christians set their hope on God. And that hope does not disappoint. God tells you that, so you will be encouraged. This hope will not fail you. This hope is certain and true. Be encouraged today by this hope. A hope that for Christians will be grown as your go through tribulations. Have that perspective as you suffer the afflictions of this world. That then is why verse 3 says that we can glory in these tribulations. Some translations translate that as rejoicing in tribulations; that we can have joy amidst them. There certainly is truth to that – James 1:2 can call us to count trials as all joy because you know how God grows us through them. And yet that’s not the best translation of this verse. No, the pew bibles here translate it very well. Glory in these tribulations. It’s the idea of boasting in them. Exulting in them. There’s a legitimate kind of pride you can take in your tribulations. They can be to you like a badge of honor. Of course, that probably strikes you as a bit strange at first glace. We can understand glorying in God. But in tribulations? And yet that’s the point of this here. Verse 2 says that we rejoice, same word in the Greek as verse 3, that we glory. So verse 2 says that we glory in the glory of God. Then verse 3, “and not only that,” but we glory in our tribulations! Yes, we can all appreciate why we can take pride in our relationship with God and his glory. But can we really glory in our tribulations? Verse 3 says we can. Verse 3 says that’s what Christians do. This doesn’t make the tribulations easy. No, but we can have a positive perspective about them. It’s because of this chain reaction that we’ve seen today. It’s the mental perspective that says God is bigger than my troubles. God is able to use for good, even the bad times in my life. God is with me in the trouble-free parts of my life. But he is also with me in the troubles. When I need him the most, yes, he is there. And so for those who are in Christ, be encouraged even when those troubles come. Find mental reason to glory in them. Trust God’s wisdom and plan in it all. Because he will see that they develop perseverance, and perseverance proven character, and proven character hope. So then, persevere. Show your faith true. Hope in the Lord. By his grace you will stand and press on. And so be encouraged that his love will grow you in these things. Even now that love lives inside you because the Spirit lives inside you. His Spirit is with you in all these tribulations. Be encouraged in how God grows the Christian through all things. Praise be to God who only does great things! Copyright © 2012 Rev. W. Reid Hankins, M.Div.